Creating bible crafts for kids can be as easy as introducing children to Black Magic. I remember when I was still a child and discovered for the first time this art style. What I loved the most about it was that whenever I made a mistake, I was easily able to 'erase' with the black pastel and, then, try again. Since the story of Jacob's Ladder is about a dream that takes place overnight, I thought the previous technique will be well suited. 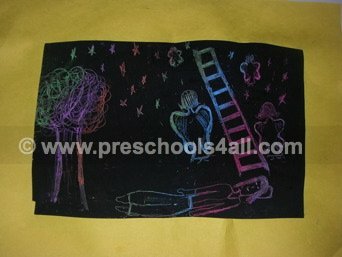 Read the story of Jacob's Ladder to refresh your memory and review some discussion points. 1. 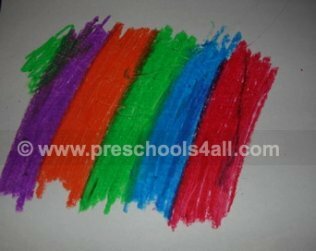 Color the paper with the pastels. 2. 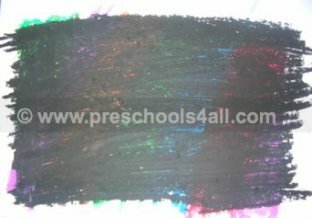 Cover the pastel colors with the black colored pastel. 3. Etch your design with the tooth-pick.